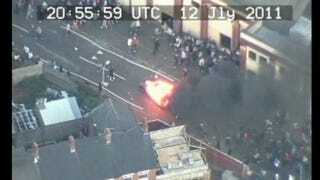 Police footage released today shows rioters in Northern Ireland attacking police with a car they'd set on fire. As it exploded into a fireball, the car rolled back downhill toward the protesters, narrowly missing the throng that gathered in the street. According to the BBC, the rioters had set the car ablaze and pushed it towards police lines in the Ardoyne area of north Belfast on July 12. Dozens ran out of the way as the burning car crashed into a garden, where protesters attempted to push the flaming vehicle back towards the police. The protests broke out after police in riot gear showed up to the yearly Protestant Orange Order parade celebrating the anniversary of the "Battle of the Boyne," and William III's victory over James II in 1690.